Honey I'm sleeping with my iPhone, can you forgive me? 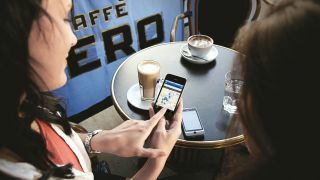 The latest quarterly Mobile Workforce Report from mobile internet provider iPass reveals a seedy world of mobile business users, who not only sleep with their smartphone, but who are so desperate to get an internet connection they steal WiFi connections. The iPass survey canvased business mobile users worldwide and found some interesting and revealing information. Nearly three quarters (71% ) of Asian mobile workers reported they sleep with their smartphones in the bedroom, followed by 58 percent of North Americans and 55 percent of Europeans. Although fewer slept with their mobiles in Europe than in Asia, the mobile usage caused more friction in mobile workers' personal lives with their partners, family and friends. The highest amount of friction was reported in Europe at 38 percent, followed by 33 percent of North Americans and 30 percent of Asian respondents. Which is somewhat surprising considering more than half (56%) of Asian mobile workers, sometimes or obsessively, wake up during the night to check their smartphone, followed by 31 percent of North Americans and 21 percent of Europeans. Additionally the first thing 38 percent of North American mobile workers do when they wake up is check email, followed by 33 percent in Asia and 29 percent in Europe. Eighty eight percent of these "globally mobile" workers said wireless access was as important to their lives, or almost, as running water and electricity while 95 percent reported significant reductions in their job productivity without wireless access. Of the road warriors interviewed; 29 percent had hijacked an unsecure WiFi network, while 30 percent had driven around in their car in desperation to find free WiFi. In addition the report found a 16 percent increase, since 2011, of mobile workers waking through the night due to stress. Evan Kaplan, chief executive officer at iPass explained the report's findings, "Connectivity is like oxygen for today's mobile workers. The improved ability to work anywhere as long as they are connected appears to be driving higher productivity. This reinforces the need for IT departments to provide services that ensure high quality, safe and affordable global connectivity for their employees,"
Kaplan warned that having control over when, where and how users worked could bring significant benefits in terms of well-being, but it could also cause problems, "mobile workers themselves need to take care to manage the unique stressors that an always connected work-life brings," he said.